Did you know that dolphins can't breathe underwater? Tom surrounded by Gray Reef Sharks at Kwajalein Atoll. Few people would deny that I have an interesting occupation. At the very least, it makes a good ice breaker at parties. When I tell people that I’m an underwater photographer, it doesn’t take long for the inevitable question: Do you ever work with sharks? What is it about sharks that intrigues so many people? Perhaps the fear of sharks breeds a kind of fascination. I never cease to be amazed by the apparently limitless appeal that sharks have. On rare occasions when someone is killed or severely injured by a shark, it makes headlines around the world. Shark documentaries air on television regularly—so often in fact that we seldom see a fresh approach to the subject. I got started shooting images of sharks for purely financial reasons—shark pictures sell. I love photographing just about all underwater life, but the market for shark images is much stronger than the market for pictures of pretty reef fish, crabs or nudibranchs. The first thing I discovered about working with sharks is that it’s hard. Sharks do not often cooperate with photographers, and sometimes, try as I might, I come home from a shark expedition with nothing to show for it. I went all the way to Midway Atoll during the “Tiger shark season” looking for Tiger sharks. I came home with plenty of pictures of albatrosses, but no pictures of Tiger sharks. Another thing I discovered about sharks is that they are expensive. It seems that sharks have decided to live in remote places that cost a lot of money to visit. I spent $7,000 to go to South Australia to shoot pictures of Great Whites. Fortunately, I got a few good shots that time. It’s actually strange that I have continued with my interest in sharks. Very early in my shark photography career I very nearly was eaten alive by a pack of hungry Gray Reef sharks out on Kwajalein Atoll in the Marshall Islands. Back in 1994 I was there working on a film about sharks for PBS with my old friend Tom Krasuski. We chose to work on Kwajalein because the guidebook said that Kwajalein lagoon was “infested with sharks" and Tom had some contacts there. 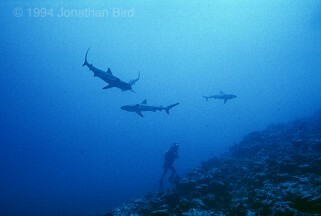 For two weeks we had been chumming one area of reef that had a large group of resident Gray Reef sharks. Gray Reef sharks do not reach very large proportions. In fact, they are kind of small, reaching only about five or six feet in length. But they tend to hunt and live in groups. Sometimes the groups can be as large as 30-40 individuals. A school of that many sharks can be pretty intimidating, and could easily devour a man in seconds if they wanted to. Our daily regimen with the sharks began when we dropped anchor at the site and started putting on our gear. We then would drop down to the reef and start filming. Over a couple weeks we had acclimated the sharks to our presence with frequent visits and tasty snacks to bolster their confidence. In general, however, they acted skittish around us and we found it frustrating that these animals seemed too frightened by our scuba gear to approach close enough for decent shots. One fine day we arrived at the dive site, dropped the anchor and dozens of sharks showed up at the surface near the boat. This pattern had been well established in the past. The sharks showed up when we dropped anchor, but by the time we got all our scuba gear on and cameras ready, they had left, and we needed to draw them back with chum. On this particular day, I decided to try shooting some video with just my mask, fins and snorkel as soon as we arrived. I grabbed my stuff as soon as the anchor had been set, and jumped into the water before the sharks left. I started fidgeting with the camera to get everything ready to shoot as the sharks circled me closely. I was so busy with the camera that I didn’t realize just how closely they were circling. I also didn’t realize there was a current running and I was moving away from the boat. When the first shark swam close enough that I felt the water move as he passed me, I decided to forget about the camera and take a look around. I had drifted about 100 feet from the boat and the sharks had taken an intense interest in me. It’s interesting to feed sharks down on the reef and watch as they size up the fish you are offering them. Sharks like to be cautious. They often circle a tasty morsel several times before deciding to lunge for it. Then they often lunge, but don’t bite. They just bump it a little to see what will happen. If nothing bad happens, then they circle around again and take a bite. A big bite. It is not so interesting to be the tasty morsel. I knew I was in trouble when I realized that the sharks were circling me the way they do when they are about to take a bite. I knew that when they started bumping me, I had very little time before they would start biting. Looking around, I counted dozens of sharks. I started swimming back towards the boat as best I could, while keeping my mask in the water and watching the sharks. I turned around and around to keep an eye on as many as I could. Each time I turned, a shark that had been sneaking up behind me turned and swam off, only to glide around and make another run at me from another direction. The sharks swam all around and under me. I was hopelessly surrounded. I could not take my face out of the water and yell for help because I felt for certain that the short distraction would give a shark an opportunity to get close enough to bite. I quickly glanced up at the boat and yelped through my snorkel. My friends, chatting as they put on their gear, just smiled in my direction, taking my call for help as a gleeful sign that I was getting great shots. One even waved. They had no idea that I was only seconds from being attacked. When the first shark struck me, I lashed out hard at it. I pushed my camera into its face as hard as I could. The shark took the hit in stride, turning away and coming back at me from another angle. My memory at this point is fuzzy. I remember screaming loudly through my snorkel, while I bashed, kicked, punched and slammed every shark that came within reach. I used my camera housing as a weapon. At the same time, I swam feebly towards the boat, unable to put much of my effort into swimming. By then, my friends on the boat had realized what was happening. They were trying to start the engines and release the anchor to get to me. I have no idea how long it took, but before they got the boat untied, I made it to the boat. All three of them grabbed me by my wetsuit and pulled me from the water. I clearly remember the sharks actually lifting their heads out of the water snapping at me as I was pulled free, almost like a cartoon. I had literally been pulled at the last minute from possible death. I sat on the bottom of the boat and trembled in fear. My adrenaline had been pumping hard to keep me going, but once out of the water, I couldn’t stop shaking. My camera’s dome port on the lens was ruined, scratched from being repeatedly jammed into the rough skin of the sharks, but I had survived without a scratch. We all laughed nervously, but it wasn’t funny. 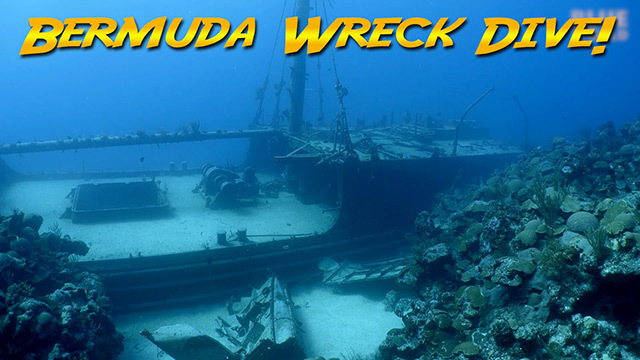 I have two friends, very well-known underwater photographers, who were on separate occasions both severely injured, nearly killed, by a single Gray Reef shark that was aggravated. A single small shark can remove a grapefruit-sized chunk from a person in a single bite. Under such circumstances, a person would bleed to death in minutes. About an hour later, the sharks had left and we prepared to do our dive. I had calmed down, but still had reservations about entering the water. I nearly sat the dive out except that I knew the sharks would not act aggressively with us underwater. Swimming among the sharks, people seem to be accepted as something that belongs--loud and disruptive too, maybe a little scary—but not food. They keep their distance. But snorkeling on the surface, people look like something dead or dying, something that doesn’t belong and might be good to eat. Once underwater, the sharks acted like their normal selves again. I decided that I would never, ever snorkel with sharks again! This became my number one rule: don’t snorkel with sharks! People usually have one of two feelings for sharks. Most people fear them like monsters, afraid of what they can do. A minority of people (mostly avid scuba divers) seem to love sharks and think of them as somewhat indifferent creatures, not really dangerous to people. I believe the truth lies between these two extremes. It’s incredibly unlikely that you will meet your end in the jaws of a shark, but I still recommend a healthy dose of respect for an animal that can eat you if it wants to. They aren’t bunny rabbits. I learned a great deal of respect for sharks that day on Kwajalein. I still love sharks, and find them among nature’s most fascinating and beautiful animals. The experience never diminished my passion for sharks, but it did remind me that sharks are predators, and yes, they can eat you.